AJW Retro Classics #5: The Crush Gals Clash! AJW Classics #5: Lioness Asuka vs. Chigusa Nagayo! This is an interesting event, let’s see how it shapes up. This match is part of the Fuji TV Cup Japan Grand Prix. 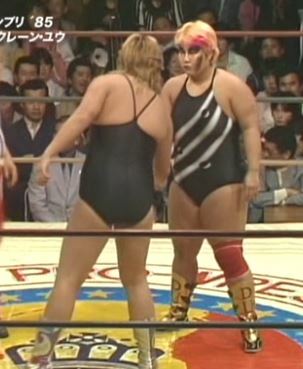 Hori and Omori at the time of the event were the popular tag team Dynamite Girls and held the WWWA World Tag Team Championship in 1983, but in Japan when a singles tournament comes up all friendships are off. Hori was the older of the two and debuted first, but Omori was on her level by 1985. Omori dropkicks Hori as soon as the bell rings but Hori comes back with a bodyslam. Omori yanks on Hori’s arm and puts Hori in a backbreaker, and Hori rolls to the apron to get her back worked on. Back in, Hori and Omori trade chops but Omori tosses Hori to the mat and drops Hori with a gutbuster. Hori rolls out of the ring to re-group but returns after a moment and stomps on Omori, working on her leg. Omori gets Hori up and slams her stomach-first, but Omori tosses Hori off the top turnbuckle. Back bodydrop by Hori and she covers Omori for a two count. Back up, Hori throws Omori into the corner but she jumps up on the top turnbuckle and hits a diving lariat. Hori then goes up top and hits a diving crossbody, piledriver by Hori but Omori bridges out of the pin. Backdrop suplex hold by Omori, she picks up Hori and she hits another one for the three count! Jumbo Hori wins the match! The most exciting thing about this is Hori trying to kill Omori at the end with the piledriver and backdrop suplexes, as up to that point not a whole lot of interest was happening. They had oddly little chemistry for two wrestlers that team together, as there were a few missteps in a match that not much was shown of. The last few minutes were great for sure and there were some big hits in this, but as an overall match it just felt too segmented. This match is part of the Fuji TV Cup Japan Grand Prix. Unlike the last match, these two were already starting to show signs of not being on the same page. They had lost the WWWA World Tag Team Championship earlier in the month in controversial fashion, leading to some discord in Gokuaku Domei. Plus there was a younger wrestler waiting in the wings to move up the ranks, a wrestler by the name of Bull Nakano. They shake hands to start but they are pleasant for about six seconds before Matsumoto drags Yu out of the ring and slams her repeatedly into the table. After choking and whipping her around the ring, they back into it and Matsumoto chokes her some more. Matsumoto stabs Yu repeatedly in the head until she starts bleeding all over the place, then Matsumoto stabs her in the head some more. Even Abe finds the violence excessive but Matsumoto swats him away and keeps up the attack. Yu manages to get a chain and chokes Matsumoto with it, she then gets a chair and hits Nakano with it but Nakano hits her back. Matsumoto lariats Yu and hits Abe with a pail, she covers Yu but Yu bridges out. Irish whip by Matsumoto but the two collide, Matsumoto takes Yu to the corner and bites her in the head. Yu is continuing to bleed everywhere as Nakano comes in, as if Matsumoto needs help, and they lariat Yu. Yu is beaten around the ring and slammed into the ring post, the referee finally has enough and calls for the bell, so it is either a Double Countout or Matsumoto was DQed, who knows. This match is part of the Fuji TV Cup Japan Grand Prix. A fitting “main event” of this airing, as no two wrestlers in AJW were as popular as Asuka and Nagayo. Still a close tag team (they would remain a team for years after this), Asuka and Nagayo did have to occasionally battle each other as well when tournaments and titles came between them. At close to the same age and with the same level of experience, neither had a clear advantage over the other, and the crowd was red hot to see which Crush Gal was better. They start on the mat as they feel each other out, but neither gets a real clear advantage. This was definitely starts slow as they struggle for the upper hand, Nagayo gets the first real advantage as she goes for the Scorpion Deathlock and she finally gets it locked in. Asuka gets out of it but Nagayo picks her up and drops her with a piledriver. Nagayo goes for Asuka’s arm but Asuka lifts out of it and throws Nagayo to the mat. Now it is Asuka that gets the Scorpion Deathlock applied, she picks up Nagayo and hits a piledriver of her own for a two count. Dropkick by Nagayo but Asuka comes back with a back kick followed by a vertical suplex. Diving body press by Asuka, she gets Nagayo’s waist but Nagayo reverses positions with her and hits a German suplex for a two count. Nagayo applies a stretch hold to Asuka but Asuka gets into the ropes, kicks by Nagayo but Asuka puts her on the turnbuckle and hits an avalanche backdrop suplex. Double underhook by Nagayo and she hits a suplex, Irish whip by Nagayo and she delivers the heel kick for a two count. German suplex hold by Asuka, but Nagayo gets a shoulder up. Giant Swing by Asuka but Nagayo hits a quick backdrop suplex, Asuka grabs Nagayo and drops her with a piledriver. Asuka goes up top and hits a jumping kick to the chest, she picks up Nagayo but Nagayo kicks her in the chest and hits a leg drop. Asuka chops Nagayo in the chest and kicks her in the head, and they trade kicks back and forth. As they count down to the end of the match, each wrestler goes for quick pins but neither can get the three count. The bell rings, and the match is a Draw. I’ll give this event some credit for being different. The recent Classics were focused on tag team matches, while this was is the opposite as the partners were battling against each other. The bloodbath was the most memorable match for sure, and the most meaningful as it showed the change in the pecking order of Gokuaku Domei. The main event was disappointing, only in that both are amazing wrestlers and they didn’t seem to be going full force for the bulk of the match, content with going to the Draw. Some fun to be had, but nothing that really blew me away.